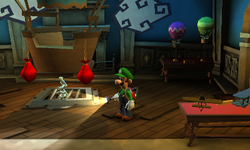 The Aviation Exhibit is a room in Treacherous Mansion in Luigi's Mansion: Dark Moon. This room is accessed via the top left most door in the West Corridor. The Aviation Exhibit has various displays related to planes and other aircraft, including a plane model to the right, tables with hot air balloon displays near the south and a giant balloon in the center of the room. In Double Trouble, the Aviation Exhibit is an entirely optional area that isn't required to be visited. If Luigi does go in however, he can get a gem by pulling on the sandbags attached to the balloon in the center of the room to pull the grate in the floor up. He does, however, have to fight a Strong Hider and two Strong Greenies beforehand. In Paranormal Chaos, the mission's Boo has made the balloon in the center of the room invisible. Revealing it with the Dark Light lets Luigi capture him. In Terrifying Invasion, the Aviation Exhibit might be one of the rooms infested with ghosts. This page was last edited on August 8, 2018, at 19:34.